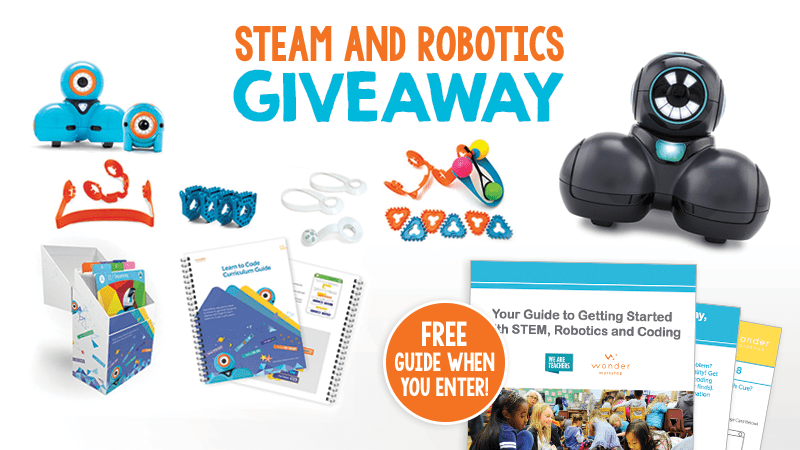 WeAreTeachers and Wonder Workshop are giving away some amazing STEAM bundles to 11 very lucky teachers (and their students) who are ready to explore coding and robotics. There’s no limit to where your students’ imaginations can take them, and these Wonder Workshop creative bundles put extra STEAM power and capabilities in their hands. Check out the prizes below! You’ll also get a discount code to get $30 off anything in Wonder Workshop’s online store through Oct. 31, 2018, with a minimum $100 purchase. Tackle the world of coding and robotics and explore the endless possibilities! Enter now, and you’ll receive the outstanding “Guide to Getting Started with Coding” that includes how-tos, fun robot activities, offline games, and more. Mix things up with your fun STEM and robotics curriculum! Maker Station must-haves: Supply ideas we love for play, inspiration, and innovation. Ideas for setting project expectations and classroom goals. A little inspiration and organizational best practices will take your coders far! Up for a challenge? Get free activities designed for both early grades (2–5) and middle schoolers (6–8). Challenge your young coders to program robots to play amazing games, like follow the leader and bowling! Unplug with coding word search games, robot outfit making, mazes, and more. Enter the Giveaway and Get Your Guide! Cue robot STEAM pack for middle school students This creative coding bundle includes six Cue robots, harnesses, dry-erase markers, whiteboard mats, and project cards to get your middle schoolers' imaginations sparked and soaring! You can then display their robot-drawn artwork in your classroom! Classroom pack with Dash & Dot for elementary school students This classroom bundle is perfect for a large group of student Bundles (up to 36), including six Dash robots, six Dot robots, launchers, building brink connector sets, accessory packs, challenge cards, a curriculum guide, and more. It's ideal for a three-to-one student-to-teacher ratio. Teamwork! Your chances don't end there! 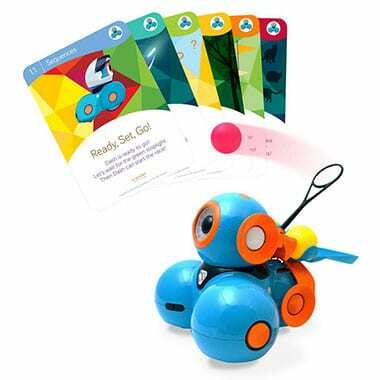 Dash Robot with Dash Challenge Cards + Launcher Bundle This action-packed bundle is a great starter set for groups of students new to the coding world. Students learn how simple machines, like levers, work and learn about trajectories with the included robot launcher. Explore all that Dash can do with the included challenge cards. No purchase necessary. Making a purchase will not increase your chances of winning. The promotion is open only to legal residents of the United States who at the time of entry are a) eighteen (18) years of age or older and b) currently employed full- or part-time as an educator by an accredited public or private K-12 school in the United States. WeAreTeachers is the official administrator of this program and Wonder Workshop is the Sponsor. Employees of WeAreTeachers or the Sponsor and their affiliated companies, subsidiaries, distributors, sales representatives, agents, advertising and promotional agencies, and the immediate families and household members (parent, spouse, child or sibling) of each are not eligible to participate. The Promotion is subject to all applicable federal, state, and local laws and regulations. Entrants must follow the entry instructions. Entries generated by script, macro, robotic, programming or any other automated means are prohibited and will be disqualified. All entrants must be legal residents of the United States of America with a current U.S. address for prize fulfillment. Prizes that require shipment will not be shipped internationally. Each entrant may only submit one completed form. All published prizes from the Sponsor are fulfilled by the Sponsor and are the sole responsibility of the Sponsor. The Sponsor is responsible for contacting winners and fulfilling all other related prizes directly to the winners. WeAreTeachers and its Sponsors make every attempt to fulfill prizes. Prizes unclaimed after 60 days are not awarded. Any depiction of prizes is for illustrative purposes only. All prizes are awarded as-is and without warranty of any kind, expressed or implied. Winners are responsible for all taxes on prizes received. Product prizes are not redeemable for cash or transferable. No substitution allowed except, at Sponsor's sole discretion, a prize of equal or greater value may be substituted. Only the number of prizes stated in the Rules is available to be won. All prizes will be awarded provided a sufficient number of eligible Entries is received. WeAreTeachers and the program Sponsor reserve the right to extend the submission deadline and/or winner announcement. WeAreTeachers and the program Sponsor reserve the right to modify, cancel or suspend the Promotion or any part of it. WeAreTeachers and the program Sponsor are not responsible for incorrect or inaccurate entry information whether caused by Internet users or by the equipment or programming associated with or utilized in the Promotion or by any technical or human error that may occur in the processing of the entries. Sponsor is not responsible for computer system, phone line, hardware, software, or Promotion malfunctions or other errors, failures, or delays in computer transmissions or network connections that are human or technical in nature. WeAreTeachers and the Sponsor retain the discretion to make all decisions regarding the interpretation and application of these rules. All decisions are final and discretionary. The laws of the State of Connecticut shall govern this Promotion. The courts of Connecticut shall be the exclusive forum for any dispute relating to these Rules and/or this Promotion. All participants and winners agree, by their participation in the Promotion, to submit to the personal jurisdiction of the courts of Connecticut. Prizes may be considered income, and any and all taxes associated with prizes are the responsibility of the winners. Enter for a Chance to Win a Mini Photo Printer for Your Classroom. Plus a Full-Size Printer, Too!